Star Wars Rebels explores new ideas and teaches Ezra an important lesson when he experiences the other side of the gateway he entered in the previous episode. To the best of my knowledge the Star Wars franchise hasn’t dealt with time travel. Visions of the future are fairly common but time travel isn’t something that happens. There are examples of it in the expanded universe but they are fairly minimal so this episode could be the first canonical example of it; certainly in the Disney version of Star Wars canon. My point is that Star Wars has largely told linear stories where the characters have clues to the future but remain in their own time frame. This episode changes that by having Ezra emerge in the titular “World Between Worlds” where all that is and all that ever will be plays out on a winding path with various portals allowing access to it. This makes for a good excuse to make use of some clips of Alec Guinness as Obi Wan Kenobi, Daisy Ridley as Rey, Adam Driver as Kylo Ren and Lupita Nyong’o as Maz Kanata among others. 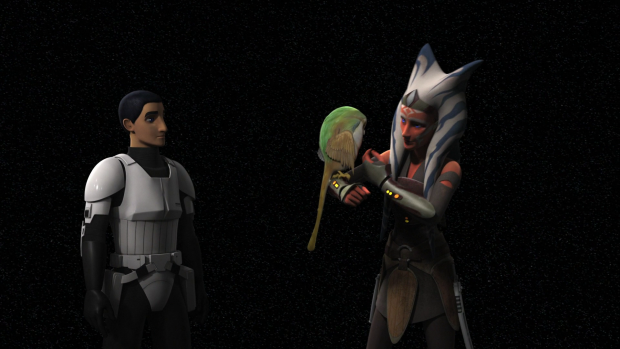 It makes for good fan service and helps solidify Star Wars Rebels as an important part of the established timeline. The concept of time travel is confirmed almost immediately as the Alec Guinness voice clips are from A New Hope which is in the future of this current episode. Of course Ezra is in no position to understand what he’s hearing but for fans of the franchise it’s very clear what is happening. 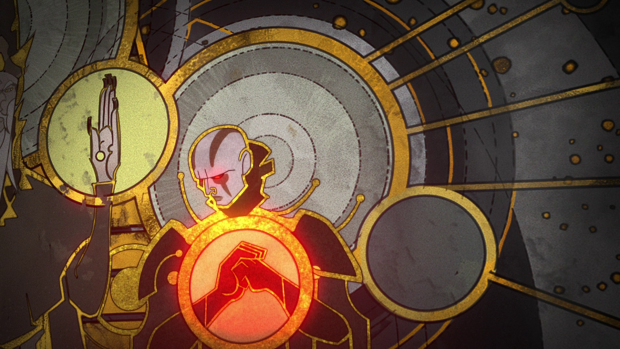 Ezra learns that he is outside the normal flow of time when he comes across the point of Ahsoka’s apparent death in “Twilight of the Apprentice“. He sees the moment that he looked on helplessly as Ahsoka battled Darth Vader and wouldn’t let him help her. Ezra is able to change this outcome by reaching in and pulling Ahsoka out before she dies and therefore changing the past in a small way. Ahsoka’s fate was left ambiguous for a reason but this episode seems to confirm that she would have died had Ezra not intervened and since he brings her into his present there are no real alterations. 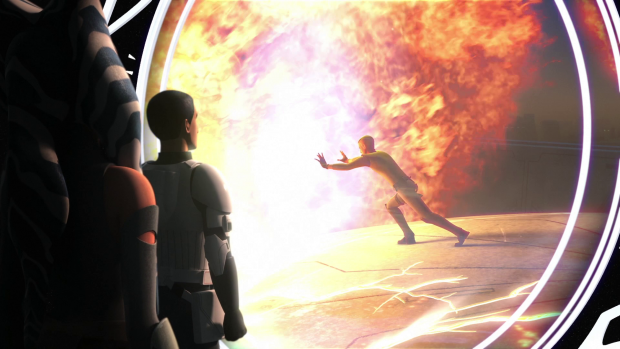 This action gets Ezra wondering if he can change the past in other ways such as altering the events surrounding Kanan’s death. Ahsoka warns him not to do this because Kanan’s sacrifice was an important one since it saves the lives of the rest of the crew. If his sacrifice is undone then the Ghost crew all die and it’s unclear what that means for the timeline. The episode isn’t interested in exploring that and instead uses this as an important lesson for Ezra who learns that just because an outcome can be changed doesn’t mean it should be. In this case he has to appreciate the consequences of Kanan’s sacrifice and why he was in the exact right place at the right time. Undoing that would invalidate what happened and undo the importance of the sacrifice. Interestingly the sacrificial moment for Kanan is very similar to the Ahsoka’s which clearly sends Ezra down the path of repeating it for his fallen master. Ahsoka isn’t hugely comfortable with being brought back but she understands that doing so doesn’t affect the timeline where saving Kanan would. Ezra’s realisation is handled brilliantly with a strong emoitonal performance from Taylor Gray. She is something of an authority on this subject as she knows what it’s like to deal with a fallen master. The ability to change the past will come with its own temptations for her as she could theoretically prevent her master from becoming Darth Vader. This is something she won’t do because she has no idea what the repercussions will be so is making the difficult decision to let the timeline proceed as it always has. There’s also a sense that she feels like she no longer belongs to it since she was “supposed” to die during her battle with Darth Vader. It’s an interesting dilemma and the episode doesn’t explore it as fully as it could but the focus is definitely on Ezra learning a lesson about the importance of events playing out and the effect that certain choices have on the Galaxy as a whole. He went to the Temple thinking that it would answer how to defeat the Empire and came away with an important life lesson that will likely become instrumental in the final episodes. Nothing seems to be accidental at the moment and it’s clear that Ezra was manoeuvred to this place for a reason. Emperor Palpatine continues to not be well used in this episode. He randomly shows up at the other end of one of the time portals and proceeds to attack both Ezra and Ahsoka. His only purpose seems to be limiting their time spent exploring the possibilities of where they are and accelerate their departure. The presence of the Emperor does indicate that the coming events are significant but what he did here wasn’t quite enough to inspire the necessary terror as the image of Ezra and Ahsoka running away from blue flames was more bizarre than tense. Ezra returns to his starting point and Ahsoka appears to return to Malachor but manages to be outside the Temple rather than trapped inside it which is definitely an improvement. Darth Vader’s fate was never explained following those events so it’s possible that there will be another confrontation between them that could explain why Ahsoka isn’t involved in the events of the trilogies set after the events of this episode. Another possible explanation involves the use of the “World Between Worlds” as an way to remove Ezra and Ahsoka from the normal flow of time and deposit them at a point where they can continue without being disruptive to established canon. 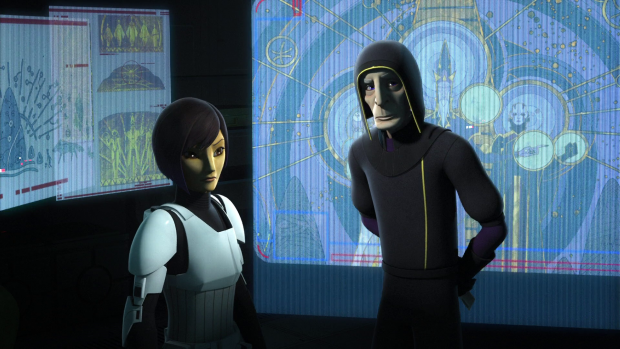 Sabine’s capture is addressed when she is interrogated by Minister Hydan who wants to make use of her skills as an artist in an effort to interpret the meaning behind the paintings on the Temple wall. At first she is resistent because she has no reason to cooperate since she assumed that either way she’ll end up dead. Helping the Empire catch up with Ezra and gain access to the secrets of the Temple would definitely not be a good thing so if she is going to die then it’s better she die not helping the enemy. Minister Hydan proves to be a really interesting character as it’s clear he doesn’t have a side as such. He has chosen to work with the Empire because they give him access to the Temple but he is far more interested in solving the mystery and gaining access to the knowledge within. This eventually allows Sabine to soften in her approach to dealing with him slightly and have an artistic conversation. She acknowledges that she has all the power in this conversation and gives over little pieces of information when she sees fit. Minister Hydan is able to fill in certain gaps because he knows about the historical context so they make for an engaging team as they both bring different skils to the conversation as well as a genuine passion for what they’re discussing. The way Sabine manipulates Minister Hydan into thinking she’s helping a lot in order to keep herself alive longer further shows how intelligent and resourceful she is. The major difference between the two characters in terms of how they pursue their passions is that Sabine knows when to walk away. She feels that the Rebellion and her friends are more important than this discovery so has no problem leaving it behind where Minister Hydan is unable to tear himself away even when he is dealing with the prospect of certain death and that is what secures his downfall. This is further evidence that he isn’t loyal to the Empire as such and doesn’t have a good grasp of his own priorities. It is an appropriate end for the character given what has been set up. Hera and Zeb aren’t featured heavily but they have the job of trying to rescue Sabine and make life difficult for the Imperial forces around the Temple. They ingeniously take over the mobile base and simply drive it away just as the area collapses and the Temple further retreats into the ground. It’s a good use of the two characters once again showing their ability to think on their feet and make the best of a given situation with minimal resources. Once again this show proves that a small group of committed individuals is more effective than the more organised and short sighted Empire. 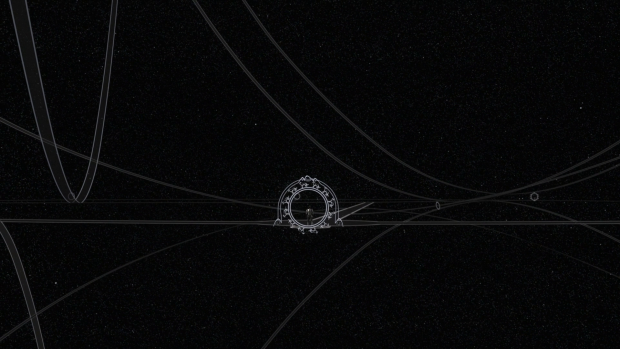 The episode ends on a mysterious note with the group in a mysterious place that stretches on seemingly to infinity. Ezra mentions that it’s the same place that he and Kanan experienced when they first entered the Temple. He doesn’t know why they found themselves there but knows that their presence there is important. Amusingly Zeb is noticeably fed up of the Jedi mysticism because of what tends to be involved and would rather return to something more normal but this ending suggests he’ll have to wait a while longer. Next up is the final run of episodes and I’ll hopefully have them reviewed the same week that they air. A fascinating episode that expands the canon Star Wars universe in interesting ways. The introduction of time travel is potentially game changing and used well in this episode. Bringing Ahsoka back to help Ezra learn that some events should never be changed makes for a really powerful dramatic moment. The implications of changing the timeline aren’t discussed in detail but Ezra’s realisation of the importance of Kanan’s sacrifice is brilliantly handled. The appearance of Emperor Palpatine feels out of place and is a less than stellar use of this character that only seems to exist to shorten the time spent in the “World Between Worlds”. Sabine and Minister Hydan working together to interpret the paintings works really well because of how the interaction progresses. At first Sabine is reluctant to engage because she feels that she will be killed either way and it’s better to not help the Empire before that happens. Eventually she softens slightly when realising that Minister Hydan isn’t loyal to the Empire as such because he’s more interested in solving the mystery. Her artistic perspective coupled with his understanding of the historical context bring different skills to the conversation and Sabine’s ability to manipulate him into believing that she’s helping a lot further reinforces her intelligence. Similarly Hera and Zeb’s idea to physically move the mobile base shows how intelligent and resourceful they are. Next up is the final run of episodes and hopefully some answers.